Introducing a new exclusive delivery system, Essiac Instant Tea. Simply add one scoop (scoop Included) into a cup or mug. Add 8 to 10 ounces of hot water. Just stir and enjoy! This unique product has an all -natural lemon flavor along with a mild plant based sweetener (xylitol) suitable for diabetics. This original product is not only effective in supporting your immune system but enjoyable to drink. 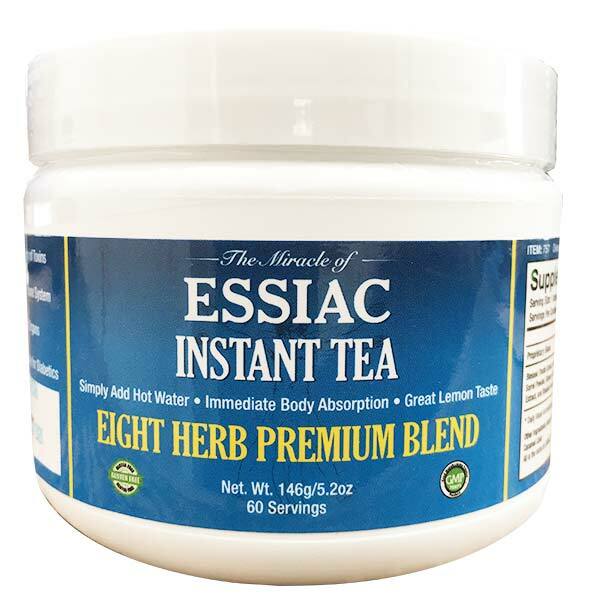 Each cup of Instant Essiac Tea is equal in potency to two ounces of brewed essiac tea or two soft gels. Therefore, for the maintenance/preventative dose you would take one or two scoops of instant essiac. Aggressive dosage for cancer is 4 scoops daily broken up through the day. For those with other ailments such as arthritis, diabetes, acid reflux and inflammatory illnesses you can try 2-3 scoops a day. Feel free to add additional sweeteners if needed to suite your taste. We would recommend Stevia, pure maple syrup or honey.